Once you have solid design ideas, it is time to put them down on to paper. This means that it's time to draw up blueprints. Blueprints are basically the road map for building your addition, and include every detail from the thickness of the wall insulation to every last architectural detail. Mistakes will be caught and fixed and details will be hammered out during the blueprint phase. 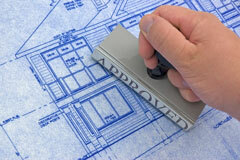 Most architects make lots of revisions and several sets of blueprints before everyone agrees they are finished. People with less complicated, smaller additions — and budgets — may choose to draw up their own blueprints. While drawing up blueprints is a complicated task, today's computer aided design (CAD) programs make it possible for some types of additions. While you'll save money using one of these programs, most of them have design limitations that result in a less creative addition. Remember, plans that were drawn by yourself or by someone other than an architect will need to be certified by a structural engineer before you get a building permit. An important part of your final plan is adjusting your addition to its site. While this is particularly important for large additions like wing additions, things like sun exposure and views should be considered for even the smallest addition. In addition to your blueprints, be sure to draw up a site plan that shows all your landscape details including the location of trees, gardens, hills, and anything else that will impact your addition. The site plan should also include the locations of power lines, streets, and sewers. Once you have your site plan on paper, design your addition so it makes the most of the outside environment. For example, you may want to add a walk-out addition on a sloped lot, or you may want to include a large window in your addition to frame the view of nearby mountains.